I had so much fun painting the four peppers that I painted the other day that I wanted to have a go at it again today. I liked the contrast between that smooth translucent pepper and the crumpled up opaque paper bag. 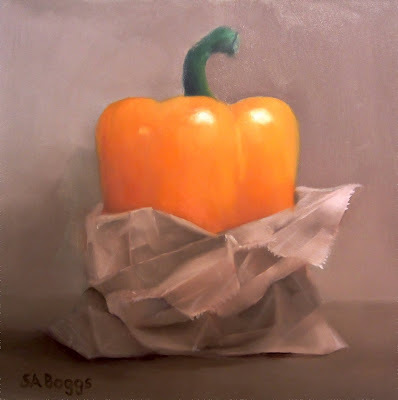 This was an interesting piece to work on because the pepper has so much color and the bag is monochromatic and much more analytical to paint. I hope that you enjoy it as much as I do. 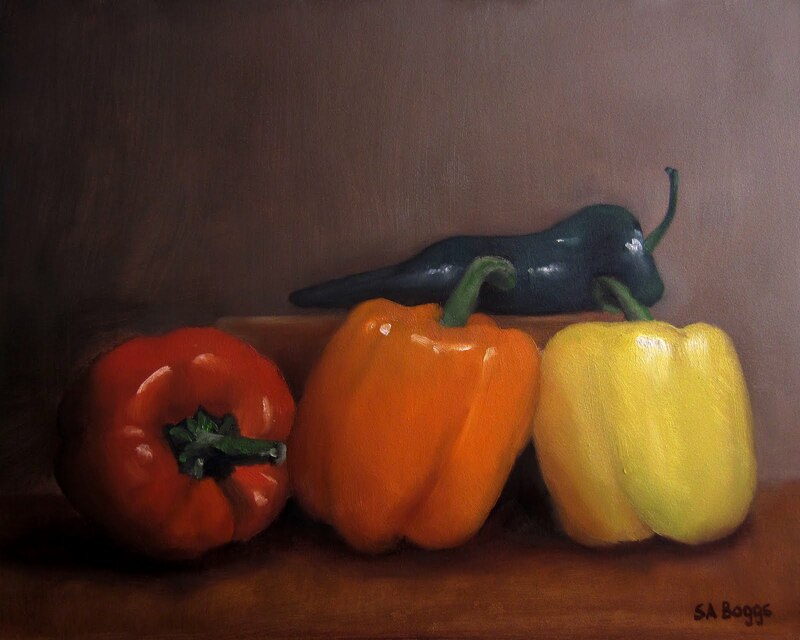 For me this painting is all about the color in those bell peppers. I saw them in the store and immediately decided to paint them. I really wanted to get that semi-translucent glow that the red, orange, and yellow peppers have. I used a gray-brown background and a reddish oak table when I set them up to accentuate the colors. I painted the red pepper on the left first and after it was finished I felt strongly that I had something going with the painting, and in the end I absolutely love the painting. I hope that you like it too. 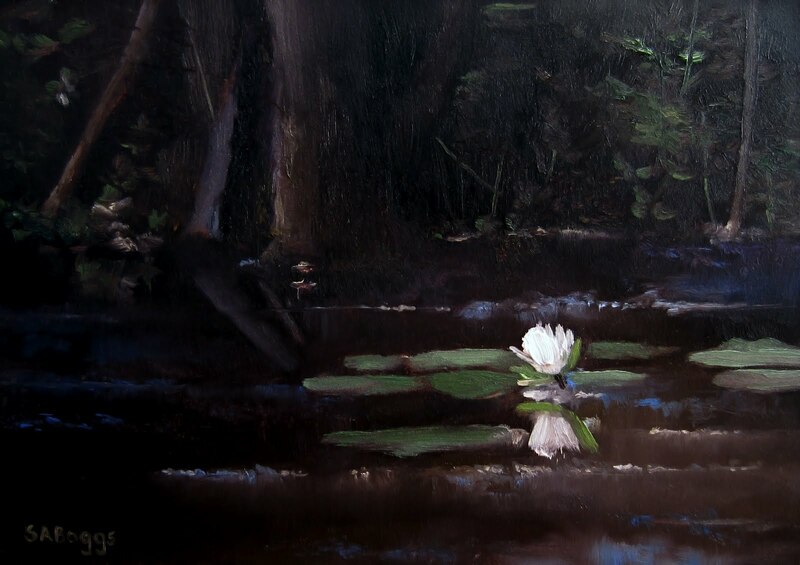 The subject is a lily and pads in a pond. This is a lily in the late afternoon on a pond in Kansas. This area of southeastern Kansas around Pittsburg and Frontenac is loaded with beautiful ponds that were created from the coal mining there decades earlier. This scene was the result of one of those singular moments that you get if your lucky, when the light, the subject, and the surrounding structure are just right. There is nothing contrived in this painting. I just happened upon a pond with a single lily in the sunlight at the right time of day. Wonderful opportunity for a painting. I hope that you enjoy it. The subject is two turnips, an eggplant, and a bunch of green onions. 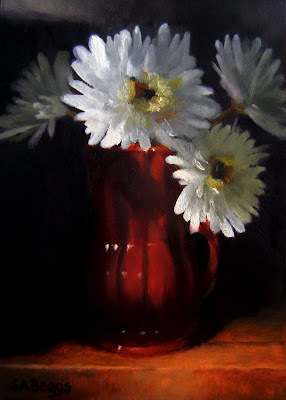 The most important thing for me in this painting was the light. 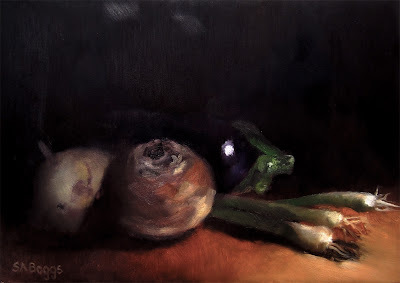 Painting this chiaroscuro, where parts of the subject emerge from darkness is probably what is most natural for me. 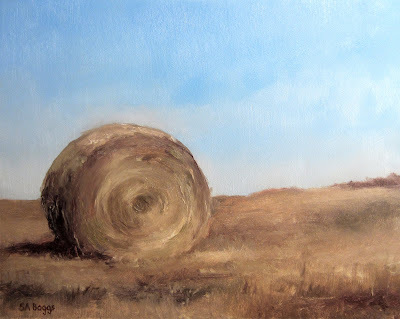 The end result of this is that I am very happy with the painting. I hope that you enjoy it. The subject is a small rocky cove on Monhegan Island in Maine. 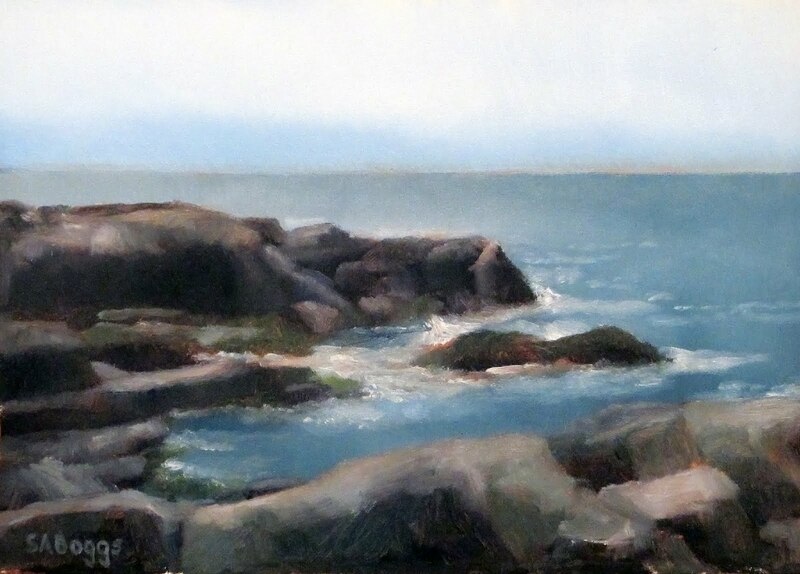 Okay, if you read my description from the painting that I did yesterday I gushed on and on about the beauty of the Maine coastline. So I will refrain from repeating myself today. This painting was done today (6/6/12) from photos that I had taken from a trip to Maine a while back. 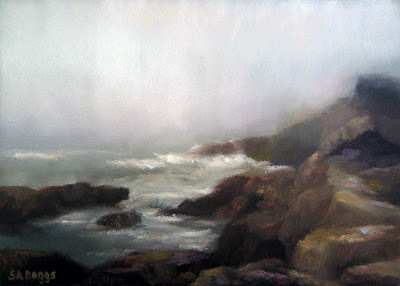 This is a small cove, one of thousands, on Monhegan Island. I love the blue water, the rocks, and the bright sunshine of the subject. I have to say that I have really enjoyed working on the last two paintings. I hope that you enjoy them too. Silver, Porcelain, and Lemon 5 in. x 7 in. Oil On Panel - Bid on or buy this painting. The subject is a silver cocktail shaker, a porcelain cup and saucer, a porcelain demitasse cup, and a lemon. The silver was a gift to me by a friend, the cup and saucer are from my wife's wedding china, the demitasse cup was from a set purchased before the coffee shop era when I made my own expresso. 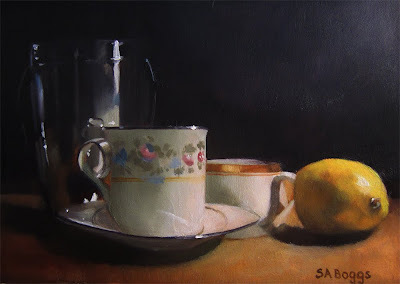 I really liked the smoothness and perfection of the china and the silver contrasted with the rougher, more abstract shape of the bright yellow lemon. I consider this to be a daily painting, however I did spend a bit more time on it to render the porcelain and the silver shaker. I hope that you enjoy the painting.